Remove stalks from kale and discard them. Wash leaves and slice them thinly. Peel the peach, and cut into a small cubes. In a large bowl, mix cider vinegar with the honey and ground black pepper. Drizzle in the 1/4 cup of olive oil while whisking. Pour dressing into another bowl or container. Add the kale and a small sprinkle of salt to the large bowl, and massage with the dressing that was coating the bowl. 5. 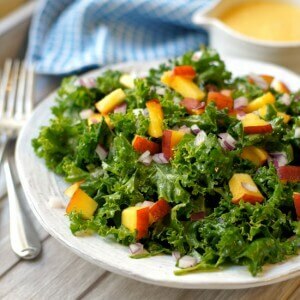 Pour the dressing over the kale, and add the peach (and onion). Adjust seasoning, toss, and serve. Quita los tallos de la hoja. Lava las hojas y cortarlas en pedazas finas. Quita la cascara de los duraznos, y cortarlos en pedazos pequenos. En una taza grande, mezcla el vinagre con el miel, aceite y pimiento. Ponga la hoja verde y sal en la taza junto con el aderezo y mezcla bien. Agrega el durazno, cebolla y servir.